A rapidly evolving global technology company, CSS Corp is the new age IT services and technology support company that harnesses the power of AI, automation, analytics, cloud and digital to address customer needs. A 5000+ headstrong company, it is spread across 16 global centres, serving over 140 clients, including Fortune 1000 companies. Acting as a catalyst for growth by enabling enterprises transform from traditional models to new age service models, it is helping them identify new revenue streams. Serving as EVP and Chief Delivery Officer at CSS Corp is Nishikant Nigam, who has over 20 years of rich IT experience in building & leading large IT services business across all service lines. He is well known for his unwavering client focus and understanding of enterprises and has built and coached many winning teams over the years. As a part of his role at CSS Corp, he is focused on strengthening its culture of client centricity. Prior to joining CSS Corp, Nishikant headed the Cloud and Infrastructure Management Services as the Vice President & Global Delivery Head at Infosys. In candid chat with Analytics India Magazine, he speaks about how the company is focusing on AI, analytics, how they are leveraging it to improve customer experience, and more. [dropcap style=”flat” size=”2″]AIM[/dropcap]Analytics India Magazine: Would you like to tell us about CSS Corp and how is it focusing on automation, artificial intelligence, analytics and digital technologies to reimagine customer engagements? [dropcap style=”flat” size=”2″]NN[/dropcap]Nishikant Nigam: Digital is increasingly changing the way products and services are delivered and consumed. Customers of tomorrow are exploring newer channels and expect personalised, proactive and even pre-emptive services. Companies across various industries are changing their sales and services strategies to attract and retain customers. In this context, businesses need to embrace adaptive and agile technologies to manage millennial expectations and growth. CSS Corp is a new age services company that harnesses the power of AI, Automation and Analytics to address specific customer engagement needs. Reimagining customer engagements through contextualisation is the core of CSS Corp’s services vision. We strongly believe contextualisation is the new personalisation. And that’s the way forward. Automation and analytics are an integral part of our service delivery organisation that supports global customers in various strategic and modernisation initiatives. We differentiate ourselves by contextual adoption of new age technologies to identify customer challenges, ambitions and objectives. Our digital platforms like Active Insights (Smart Analytics) and Yodaa (AI in Customer Support) with a strong focus on improving customer lifecycle management, transforms the way companies make decisions. As an organisation, we work closely with business decision makers who are responsible for the customer experience and revenue generation mandate. Increasingly, we see businesses are looking for new age models and solutions that generates superior experience and guaranteed business outcomes. AIM: CSS Corp has invested significantly in technologies like AI, analytics and conversational commerce platform solutions. Would you like to highlight some of the major benefits that the company has reaped in with these investments? To fuel the growing needs and expectations of customers, CSS Corp has built Yodaa, an AI platform with omni-channel interface that promotes convergence of human intelligence with machine intelligence to deliver simple and personalised customer experiences. Yodaa aims at bringing together various technologies like AI, Automation and Analytics with pre-built vertical assets, 360-degree customer context, intelligent process guidance and actionable insights that enhances customer interactions. It integrates with all customer channels like voice, email, chat and website, and provides a seamless and consistent omni-channel experience. It offers predictive intelligence, automated queuing, routing and channel allocation. Yodaa can offer personalised recommendations based on customer analytics. It can indicate customer emotions, intentions and relevant signals during real-time conversations, thus improving customer satisfaction levels. Yodaa can constantly learn from customer interactions and build on its ever-growing knowledge base. It remembers facts, learns from previous conversations and can access online information by integrating with enterprise systems. Its ability to troubleshoot, answer complex questions and engage in interactive dialog makes it a third-generation virtual assistant. Yodaa as a conversational AI solution helps an auto retailer in streamlining their customer engagement processes. It enable users to schedule appointments for auto maintenance and integrates with backend systems to check slot availability and book appointments. We are seeing other traction about Yodaa’s applicability in various client discussions. Today, Yodaa is the nerve center of all CSS Corp’s Customer Experience (CX) engagements driving customer-centricity. Yodaa recently won the 2017 Silver Stevie International Awards and has been chosen as the Best New Product or Service of the Year – Platform as a Service. Our platform has garnered rave reviews from reputed industry analysts for its novel usage of AI in simplifying customer engagements. All of us at CSS Corp are excited to explore new frontiers with Yodaa that harnesses the power of customer centricity and builds an ecosystem that fuels unprecedented growth and innovation for our customers. AIM: How are the company’s analytics solutions helping to deliver personalized experiences at every customer’s touch point? NN: At CSS Corp, we focus on delivering sustainable growth and value to our customers through advanced analytical models. Our advanced analytics models are based on the experience gained from supporting over 1 billion transactions for customers in Telecom, Media and Technology (TMT) industry. These models are built on our Active Insights platform that promotes predictability, service and resource optimisation and deliver value to our customers. Active Insights, CSS Corp’s smart analytics solution provides insights into customer propensities, topics, issues and drives new revenue streams. Based on these insights, we enable businesses to dramatically improve customer experience by offering targeted and personalised solutions to their potential customers. For instance, a large telecom company with millions of customers across the globe was losing customers due to lack of customer insights. To sustain the competitive edge, the customer decided to gain deeper insights about customer behaviour, sentiments and feedback from various channels. The customer also wanted to streamline their customer support function through analytics. CSS Corp helped them transform their customer support by analysing customer experience within/across channels using survey analytics and logistic regression. We analysed customer insights and behaviour pattern leading to additional revenue through cross-sell/up-sell initiatives. CSS Corp’s Analytics consulting framework assess organisations maturity level in decision science and continuously evaluates the effectiveness of operations against business outcome. Our framework identifies key areas of improvements and provides recommendations to move from a reactive customer engagement model to a pre-emptive model. We understand the challenges customers face across different phases of customer life cycle management and identify underlying risks. We assess their maturity with the adoption of analytics and their ability to drive insights to help customers with crucial business decisions. Based on the assessment, a customised analytics strategy and a roadmap is created for organisations. We enable them to evolve from a transaction oriented mind-set to relationship oriented thought process. Digital, Analytics and Automation Services is one fastest growing business units at CSS Corp that is experiencing unprecedented growth and acceptance from our customers. Our analytics practice has attained a staggering growth of more than 100% in the last 12 months. Analytics is at the heart of our business strategy and having said that, we have also been recognised as a ‘Strong Performer’ in Customer Analytics services by Forrester. AIM: How do you make use of analytical information and predictive/prescriptive models for better decision making? NN: Companies that deliver seamless experiences tend to retain their customers, get more incremental purchases from their customers, and generate additional revenues. To achieve this, companies need to invest in AI and advanced analytics solutions to surface new patterns and predict new contexts to influence customer purchasing decisions. CSS Corp’s Active Insights platform applies advanced predictive models to each stage of customer lifecycle, understands customer’s intent and proactively hits the target with the right recommendations and remediation. The platform connects to multiple data sources including structured, unstructured, semi-structured, social media and sensor data. It analyses and predicts data in real-time, high velocity, low latency and batch processing modes. Active Insights unleashes intelligent insights about customer sentiments, buying behaviours and satisfaction scores that drive business success. The solution aggregates customer interaction data from various touchpoints, converts that into recognisable patterns and recommends actionable insights resulting in faster issue resolution. For e.g., one of our customers in the digital streaming industry experienced sudden spike in customer complaints regarding channel unavailability. The complaints started compounding as the existing customer feedback mechanism did not allow them to identify issues in real-time. CSS Corp, using Active Insights, analysed the last 12 months’ historical data and correlated it with real-time data to source patterns. We also did extensive social media analytics to capture the Voice of the Customer (VoC), and identified that the complaints were from customers watching a specific sports channel in a specific locality in CA. We proactively reached out to rest of the customers regarding service outage of the channel and sent a proactive info push once the channel was up. This reduced the incoming calls to their customer support by 50% and resulted in CSAT increase by 13%-15%. AIM: What are the trends you see evolving in the space? NN: We are moving towards a conversational economy where voice is the new frontier. A few spoken words to a smart virtual assistant can help accomplish a seemingly complex business transaction. As AI technology is maturing, forward-thinking businesses are plugging in conversational AI in their strategic investment roadmaps to leverage it for their customer service function. At CSS Corp, we have embarked on a new journey in AI to disrupt the customer experience ecosystem with a new model called “Conversational X”. Conversational X aims at simplifying and personalissing customer engagements through AI based Voice platforms. We offer AI based solutions that enable customers to have powerful, impactful conversations with brands and helps them with insights and a new radical vision to solve a challenge. Our focus and investments in AI is helping enterprises adopt the right customer engagement and support strategy and move from traditional models to new age service models that helps them identify new revenue streams. 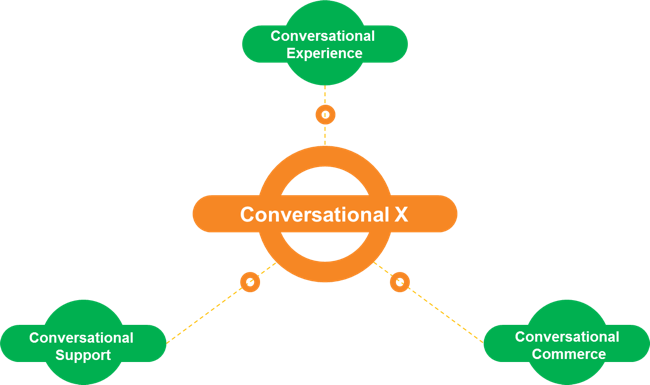 Let’s better understand the key tenets of Conversational [X] that can help enterprises and even SMBs to personalise customer interactions. Conversational Customer Experience- A new era of customer experience has dawned upon us. Voice assistants and social messaging have given birth to the intelligent experience economy, and made customer experience more conversational than transactional. You can ask Apple’s voice assistant – Siri – to get you weather updates, find out and help you buy specific movies, play your favorite songs and a gamut of other specific activities. Amazon’s Alexa can help you perform several tasks like booking a doctor’s appointment; sports scores and game times; important event dates, hear the latest news; tracking traffic; manage calendars, to-do lists and shopping lists, set alarms and timers; read Kindle books and play audio books; make purchases; control smart home devices, etc. Conversational Support- Many B2C businesses are using conversational intelligence with bots as a platform for offering customer support. We offer tech support services with this new conversational model that would field customers’ questions and get more real-time access to resolutions. This boosts overall business efficiency and cost effectiveness. Conversational Commerce- Conversational commerce refers to the real-time customer communication through different messaging applications and Chatbots. It fits into each of the distinct steps in the customer purchase journey. These platforms empower businesses generate a sense of need for their products to potential customers. The chatbots also act as personal shopping assistants to customers. Are Capsule Networks The New Building Blocks In Deep Learning?